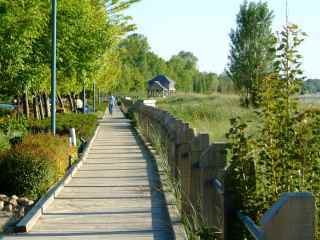 The Lake Trail is divided by the Kincardine Harbour. South of the harbour the trail follows the boardwalk (wheel chair accessible) and north of the harbour the trail is called Lovers Lane. Opposite the beach volleyball beside the water you can see the wreck of the Ann Maria. Walking south from the harbour on the boardwalk notice the gardens along the left side, all maintained by volunteers. The names of the volunteers are displayed on a plaque in front of each plot. Kiosks describe the history of the harbour. The gazebo makes a nice shaded place to stop, rest, or watch the magnificent sunsets. The wild flower berm is on the left with a bicycle path beyond. 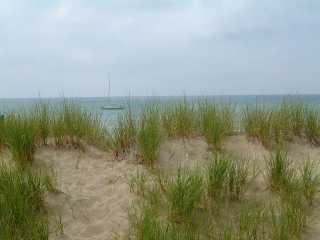 Natural grasses have been planted on the west side to help prevent sand erosion. The boardwalk continues to the St. Albert St. extension with benches along the way for tired feet. South of the boardwalk the trail follows along a lakeshore path over the former rail line. Go up the hill on Kincardine Ave., and south on Penetangore Row to follow the Rail Trail. Walk west from the lighthouse down Harbour St. to the gardens and view at the flag pole. Continue north along the paved path through Tiny Tot Park to Dunsmoor Park where concerts and sing-a-longs are scheduled Wed and Sun. evening in the summer. 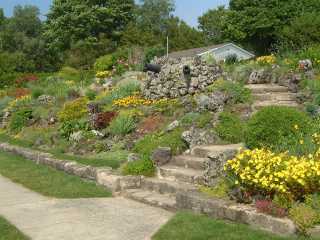 Passing the dance Pavilion on your left and north of Durham St. you will find the Rock Garden. The trail from this point is locally known as Lovers Lane. North of Broadway St. walk on the left side until you get to the beginning of the first bend in the road. 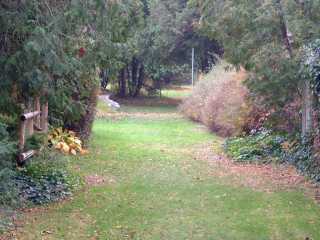 Cross over the road and follow the "Public Walkway" signs which mark Lovers Lane between Saugeen St. and the nearby cottages. The trail ends at Kingsway St. but you can continue north on the lakeshore via the small bridge leading to the beach.